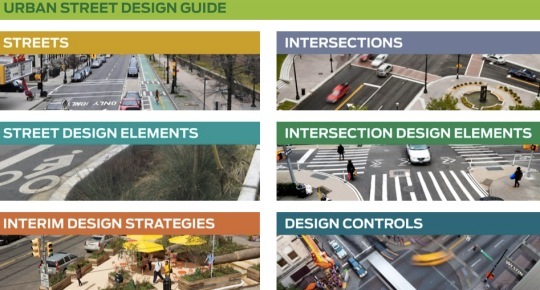 The National Asssociation of City Transportation Officials (NACTO) released their Urban Street Design Guide yesterday. 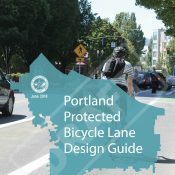 The new guide is being hailed by its creators as, “a blueprint for the 21st century streetscape” and it couldn’t come at a better time for Portland. Founded in 1996, in the past few years NACTO has been re-energized by hitching its wagon to the urban cycling revolution and its bikeway design guidelines have fueled much of the street renaissance in New York City and beyond. Back in August, the Federal Highway Administration — an agency long thought to be at odds with the innovative street designs favored by NACTO member cities — issued a memorandum officially endorsing NACTO’s Urban Bikeway Design Guide. That federal sanction of the cycle tracks, buffered bike lanes, and so on is crucial for city traffic engineers who might be wary of implementing innovative treatments that aren’t included in the FHWA’s publications. The adoption of the bikeway design guide has helped many cities across the country implement bikeway projects. Here in Portland, the release of this new guidebook couldn’t come at a better time. With new leadership at City Hall and the Bureau of Transportation — and excitement about re-envisioning our streets thanks to grassroots activism — momentum for projects like this is at an all-time high. Another good sign is that PBOT’s Division Manager for Signals, Street Lighting, & ITS (Intelligent Transportation Systems), Peter Koonce, was the primary review person for the sections related to signal timing (which is an under-appreciated art when it comes to making biking and walking more pleasant). 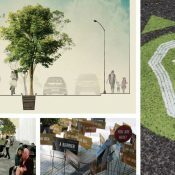 As for the guide itself, it’s a comprehensive resource that covers everything from facilities on arterials to neighborhood streets and design elements ranging from crosswalks, parklets, street closures and public plazas. You can dive into it yourself online. With a major project on the horizon to update our downtown streets a large-scale development in the Lloyd District, and rapidly changing commercial districts throughout the city, Portland has many opportunities to put this new guidebook to use. Does this mean that Portland will finally start using sharrows on arterial streets that don’t currently have enough ROW width for dedicated bicycling facilities? I hope not. That’s not going to serve anybody who doesn’t already take the lane. I strongly disagree. If nothing else, it is an important interim measure that is better than the current status of NOTHING on many arterial streets, and could be used to bridge the gap while PBOT and our local politicians work on building up their cojones to remove a travel lane and/or curbside parking, and replacing it with bike facilities. It is, essentially, a huge disservice to cyclists and an abrogation of the City’s responsibility that streets like SE Hawthorne, SE Division, SE 11th and SE 12, and E 28th don’t, at a minimum, already have painted sharrows. San Francisco saw large increases in bike traffic on sharrowed routes. …and Alta did the research leading to the installation of those sharrows in SF; why has PBOT dropped the ball and how did they silence Alta in Portland??? One day bikes will be so ubiquitous we’ll have auto-icon sharrows to indicate that cars are also allowed here. I learned something …I found it interesting that NACTO was founded much earlier than I was aware, I had thought 2006 when it caught fire with the bike issue…as I had long been looking for such a “home” to hang my hat and advocate design issues for/ with back in the late 1990s/early 2000s. Without such a home, I started similar mini discussion sidebar sessions at ProBike/ Railvolution etc. under the banner “Cities without ASHHTO” 2000-2005. Still no proper Dutch intersections. Lame! These are very unconventional to they sensibilities of US engineers (and US bicyclists), and there some major hurdles to get through. It’s going to take some baby steps to get there, but I think we’ll see them sooner than you think. That statements got Barber written all over it….You hear that ODOT!